How to tell if I have house flies. It has a characteristic zig-zag flying pattern and prefers resting on light fittings, ceilings and walls. These are far the most common fly found around the household. 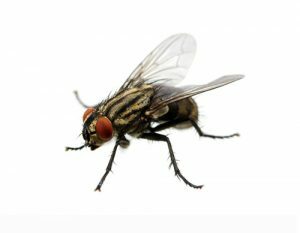 The house fly is 6 to 7 mm long, with the female usually larger than the male. Securely bag your household rubbish to keep flies away from waste food. Compost heaps should be covered or in the purpose built containers. This will minimize larvae emergence and promote fermentation temperatures at which the larvae cannot survive. Clear/clean drains and gullies often – particularly in and around kitchens to remove food waste. Flypapers hung from the ceiling can be used to collect flies inside the property and to aid identification. On agricultural premises, farm manure should be kept as dry as possible, especially in poultry houses where leaking water drinkers can provide ideal, moist breeding conditions. Dead birds, animals or rodents should be located and removed. If locating them proves difficult to use a strong air freshener or rodent deodorant to mask the smell. Electronic fly killing machines use an electrically charged high-voltage grid to kill the insects on contact. The dead insects fall into a catch tray suspended at the bottom of the machine. Sticky board machines, the insects land on the glue area of the board where they are held until they die. Boards should be changed at regular intervals and can be kept for insect identification or as the record of ‘due diligence’.